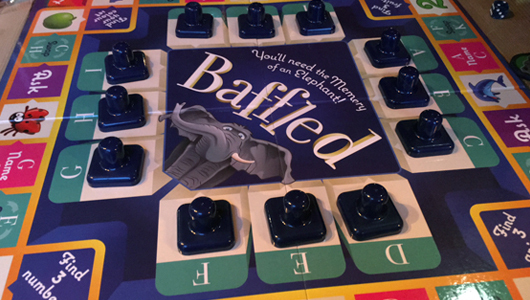 Baffled is a memory game aimed, according to the box, at kids of ages eight and above, but really a five-year-old could comfortably understand and play it too. The main focus of the game is to remember the position of tiles, hidden under the plastic covers and to be able to name them correctly as play progresses. If the tile is guessed incorrectly, a player loses one of their Life cards and the last person to still have any cards left wins the game. The tiles themselves are very simple images of animals, numbers, and fruit, easy to remember or so you think at first! The players begin by placing their markers on the board and then proceed to roll the six-sided dice and move accordingly, a-la Monopoly, the corresponding number of places on the track. Each space on the board will either require that a player guess the location of the particular tile, or allow players to challenge one of their opponents to the memory game, or will switch certain tiles around – hence making it harder to remember where everything is and, as the name of the game would suggest, baffling the player. Memory games can always be fun, in fact, arguably, the worse that your memory is, the more chaos will ensue and thereby adding even more joy to playing the game. There is an already inbuilt challenged that lies in the general concept. 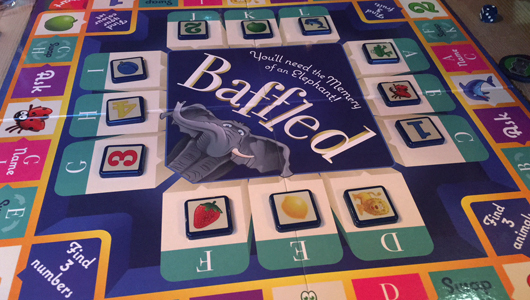 Playing a memory game is inheritably fun and therefore there is some enjoyment to be had when playing Baffled. It’s twist of constantly changing tiles just adding a bit more spice to an already great mix. However, the concept itself – trying to remember the position of tiles – is not unique to Baffled. What Baffled brings to the game is the board with different action squares and the plastic covers that hide the tiles, yet the necessity of these elements is questionable. Let’s start with plastic covers first. Mainly, because they look fun and unique, and the first time you see them, you think that practically they will be a good idea for the game. Then, you remember that you can just turn over the tiles to its blank side for the same result. Furthermore, they are far less practical than they initially seem. The idea of the game is that you remove all the covers, players spend 60 seconds memorising the position of the tiles and then the covers are all put back down. However, as the covers are all individual, the 60 seconds turns into 60 seconds and however long it takes to put the covers back on the tiles. Small nitpick, maybe, but again, it would take just as long to turn over the tiles themselves. You could argue, that it is easier to move the covers because of the handles, but then I would argue that you should just make the tiles themselves thicker. So, covers: look fun, yet irrelevant. Now, let’s turn our eye to the board. It is big, colourful, has large grids with different actions and could be entirely replaced by a custom dice, each face of which carries those action spaces. Yes, for the dice, the diversity of the actions would probably have to be sacrificed. Yet since the actions are mainly ‘guess the fruit, or the number, or the animal, or ask another player to guess the same’, simplifying it would not impact the game in any major way. So, the board: big, takes up a lot of space on the table and can be easily replaced, without major changes to the gameplay. 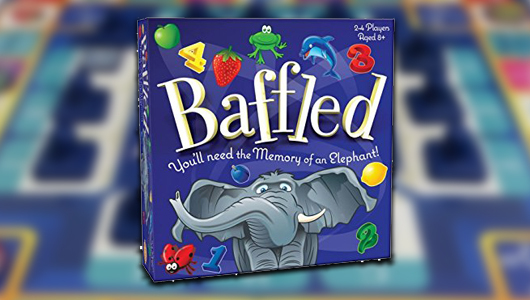 Here is Baffled, a simple to understand and to play, fun memory game with an excess of game components that bring nothing special to the table, except raise the cost of production and therefore the price of the game itself. There is, of course, no question, that in current fast-growing board game market, games have to do all they can to stand out. That includes having bigger boxes to have a more visible place on the board game shelf, and, of course, having appealing components, which one could argue, Baffled has. For comparison on this point, let’s take a look at Colt Express, a game similar in price to Baffled, that has one of the most standout game components: a 3D train. Players actually begin the game by assembling the train out of cardboard pieces. The gameplay is centered around the train, as players move their meeples through its compartments and even jump on the roofs. Every action the player takes directly corresponds to the location of their meeple and the meeples of other players. Of course, Colt Express is also famous for cardboard 3D cacti that have absolutely no game purpose and act simply as a piece of scenery. Yet, this is incredibly small part of the game. To sum up: train, a feature of the game, that is also key to its gameplay, and while its design could be simplified to bare bones two-leveled boxes, its look and design sets the wild-west theme of the game and creates an atmosphere unique to it. 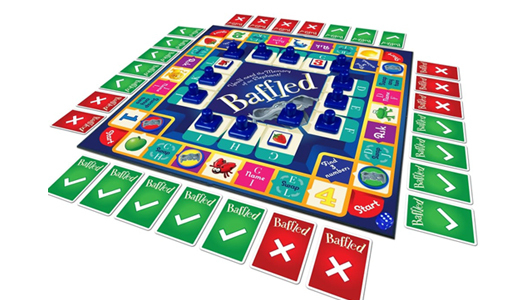 In contrast, the components of Baffled, while they make the game initially stand out, quickly become frustrating, as several minutes into the game, you realise that beyond surface there is a much simpler and streamlined game. I would be satisfied by the argument, that the board and the covers, add to the theme of the game, yet it has none. The art and graphic design are generic and characterless. While games aimed primarily at kids need to be bright, colourful and with easily recognisable symbols, it does not mean they should not have personalty. For example, King Frog and Reef Route (both I reviewed previously) are two games aimed for the same age group, both have simple, yet fun gameplay, both are bright and whimsical, both have a lot of personality in its art and design! It may seem that I am over-focusing on the component part of the game, and I am. However, that is because this is the only new part that Baffled is bringing to the table. The memory aspect of its mechanics, even with the little twist, has been done before by many games. The reason to buy Baffled is for something only this game does, and unfortunately, it does not do it well. Is Baffled fun to play? Yes! Could you drop different types of tiles on the table and play a game of memorising them which would be just as fun? Also, yes. Orchard Games do a very simple game that my children loved when they were younger called “Shopping Trolley”. While containing all the excitement you’d expect from such a title, it actually did everything Baffled did and better, while being much more engaging for youngsters.